These sticky Thai chicken thighs are the perfect weeknight dinner. Ready in just 30 minutes, full of delicious flavor and better than takeout! If I had to pick one food genre (ethnicity? I can’t figure out quite the right word here but you get the point) to live off the rest of my life, it’d be Thai. I realize that’s a bold statement and it’s weird to me that I can pick it so decisively because when asked the “what’s your favorite food?” question I literally sit there stunned into silence thinking about, incapable of providing an answer. How anyone can have a ONE favorite meal is beyond me, but I can definitely pick a whole category/genre/ethnicity. Thai is just the best. It’s got noodles for those starchy pasta cravings, fresh bright flavors thanks to ginger, lemongrass and cilantro, comfort in the form of creamy coconut milk and still plenty of meat and seafood. It’s a relatively healthy cuisine (omg, cuisine! That’s the word I was looking for!) but one that still leaves you satisfied. The closest Thai place is like 25 minutes away from me. So when takeout becomes pointless, because if you have to spend almost an hour going back and forth to the restaurant to pick it up, you might as well just eat there, you learn how to make Thai stuff at home. I realize this sticky Thai chicken isn’t actually a real Thai dish. You’re not gonna find it on any Thai menu, but it combines pretty much all my favorite things about the cuisine (minus those delicious Pad Thai noodles) into one simple chicken dish complete with crispy chicken skin and a finger licking sticky sauce. This Thai basil cashew chicken skillet is a close runner up to this Thai chicken recipe but the lemongrass flavored sticky sauce of this recipe wins me over. 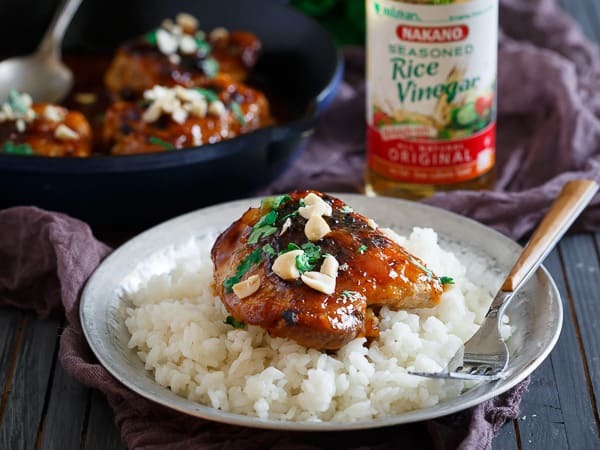 It’s sweet and tangy (thanks to some lime juice and Nakano rice vinegar) with a hint of spice and the best part is there is plenty extra in the bottom of the pan to spoon over the sticky white rice I suggest you serve it with. You could also serve it with the turmeric ginger rice from this coconut pork recipe, that would be crazy delicious with this Thai chicken recipe too. When you can make the best Thai chicken in just 30 minutes start to finish, there’s really no reason for takeout anyway. 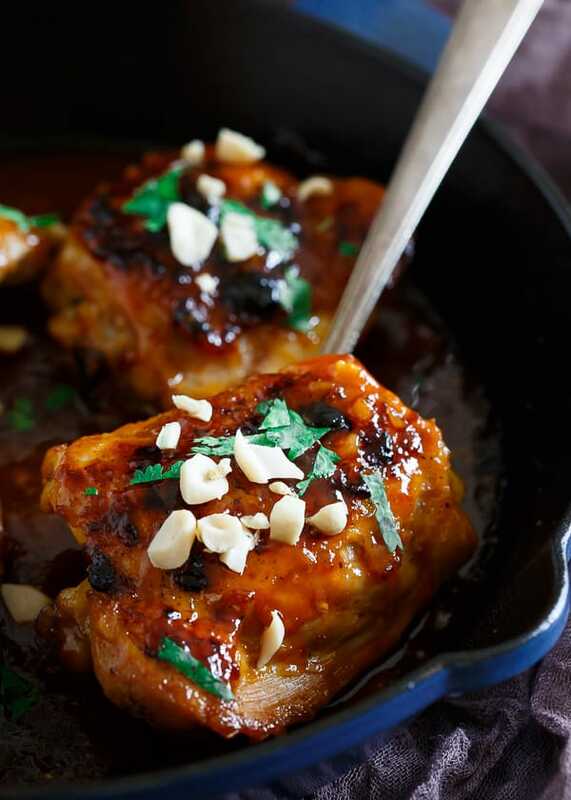 Love this Sticky Thai Chicken recipe? Check out my 20 Minute Sweet & Spicy Pork Ramen Stir Fry or this Sweet & Spicy Indian Chicken for more easy takeout inspired meals! Combine all ingredients for the sauce in a small bowl and whisk together, set aside. Season chicken liberally with salt and pepper. Place an ovenproof heavy bottomed skillet on the stove top over medium-high heat. Add the coconut oil to the skillet. Once melted, place the chicken thighs skin side down into the skillet and cook until browned, about 3 minutes. Flip the thighs, cook for another 2 minutes. Pour the sauce into the skillet coating both sides of the chicken in it. Arrange the chicken skin side up in the skillet and place in the oven to finish cooking, about 15 more minutes until skin starts to turn golden brown and crispy. Remove from oven, garnish with cilantro and peanuts and serve with cooked rice. *This post is sponsored by Nakano as part of my ongoing brand ambassadorship with them. All opinions, content and photography are my own. This sounds like an amazing quick and easy dinner! I LOVE that glaze on this chicken! Thai food is high on my list, too! I love Thai food, but my husband is too big of a wuss to go out for it. He thinks it’s going to be too spicy and doesn’t get that it isn’t all like that. 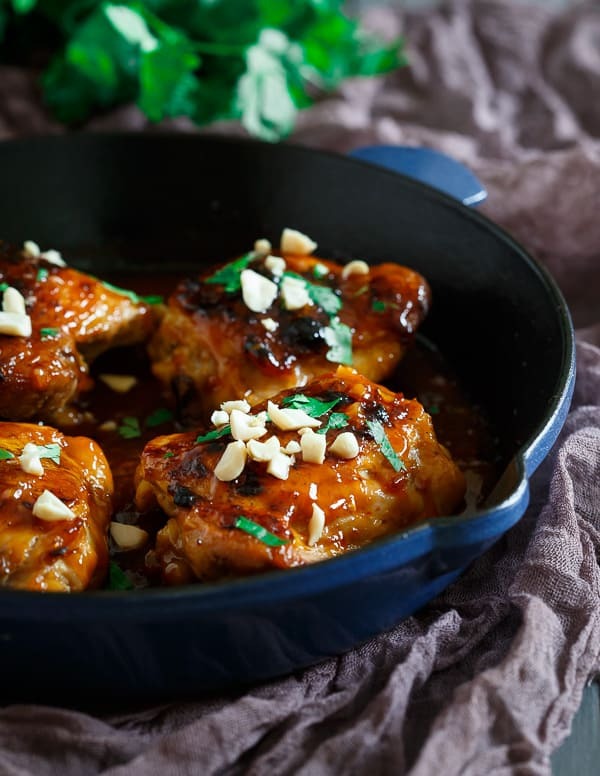 I’m thinking I need to make him this awesome sticky Thai chicken to warm him up to it then maybe someday we can actually go out for it! I have to admit that I have never eaten Thai food. But looking at these amazing pictures, I know that I have been missing out on something good! That glaze on the chicken looks incredible!!! I love everything about this dish! In fact….it’s getting me inspired for dinner tonight…Love it! WOAH! This is for sure a winner winner chicken dinner! I agree, thai food is da best! I couldn’t agree more, I absolutely love thai food! It would definitely be something I could eat everyday, all day. I can’t find lemongrass paste – where did you get it? Or is there anything you can substitute for that? I use Gourmet Gardens and find it in the produce section, usually by the fresh herbs. 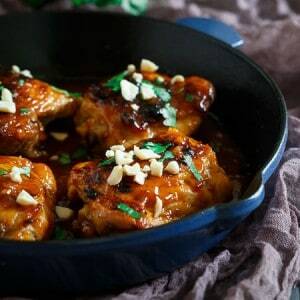 Can this dish be made with bonless skinless chicken thighs? It sounds so good and I have the boneless in the freezer.